Short Round! Y'all know that I rarely venture to the northern suburbs (east side for life, biatches! ), but when Sandra booked herself in for a Gravity Floating session in Northcote, I thought it was the perfect opportunity to round up northsiders and general hip-young-things Jenni and Jimbo for brunch! So, the idea was for locals Jenni and Jimbo (there must be a better portmanteau - suggestions in the comments please) to recommend a place, but in a classic Sarah move, I spent the week before excitedly googling and came up with a list of potential places near the Gravity Floating centre before they had a chance to make any recommendations. Oops. None of us had been to Short Round before, but it looked awesome, and luckily everyone was keen. There weren't any queues when we rocked up at one o'clock on a Sunday afternoon, and our group of four got a table straight away. 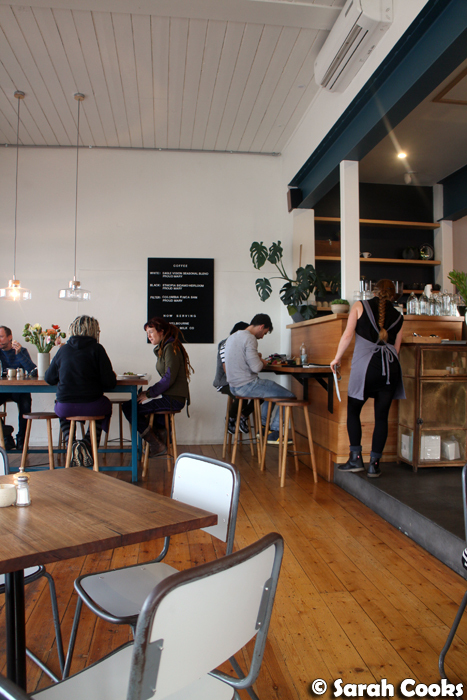 I liked the vibe of the cafe - wooden flooring, lots of space, lots of natural light. First order of business: coffee. The magics were great - rich and strong but not too bitter. Winner! Vegetarian Jenni ordered the roasted mushrooms, and it was a very fancy, restaurant-style dish. She wasn't a fan of the kale (because kale, amirite), but overall it was very impressive. 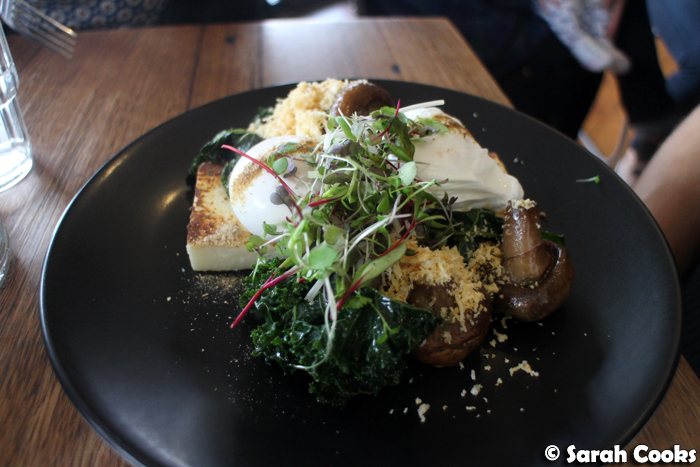 I thought that the white polenta, brioche pecorino crumbs and porcini salt made this dish very unique and interesting. I always think it's not worth ordering mussels at restaurants because they're so easy to make at home (and see my previous mussels post for a recipe), but one thing I can't make at home is fries. And these were crispy and salty and awesome. 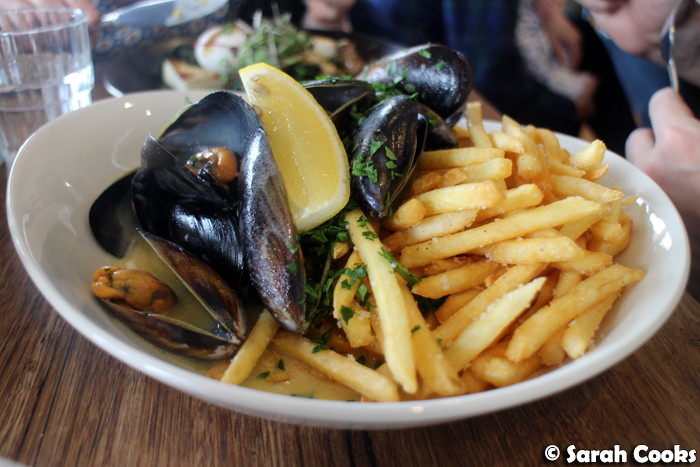 Come to think of it, moules frites is an unusual dish to have on a brunch menu, but I'm glad that Jimbo ordered it, (and even gladder that he let me try some), because it was great. Sandra's brioche sliders looked a little messy but were very tasty. 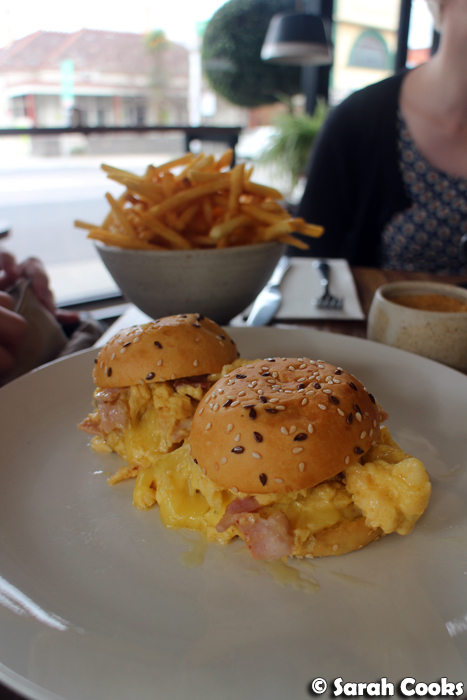 Sandwiched inside the little brioche buns were bacon and cheesy scrambled eggs - can't go wrong. Unsurprisingly, I went for one of the most decadent thing on the menu - house made waffles with honeycomb mascarpone, dark chocolate ganache and salted popcorn. 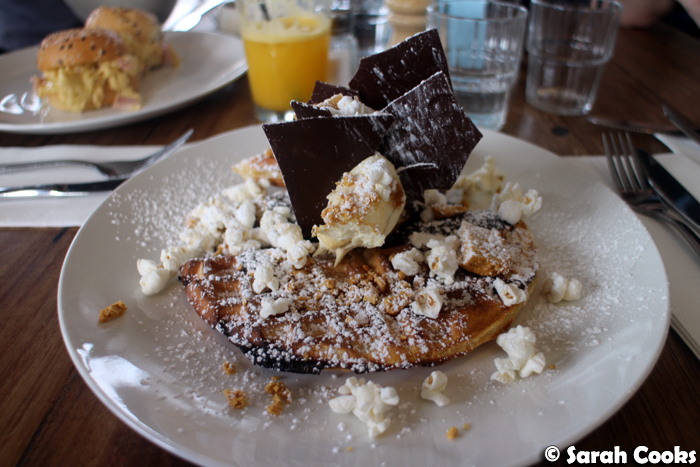 The waffle was thin and crispy and I loved slathering the rich and sweet honeycomb mascarpone all over the waffle. Delish. Sandra and I also ordered a side of fries to share. Because this is what happens when we eat out and there is no stopping us! Rar! 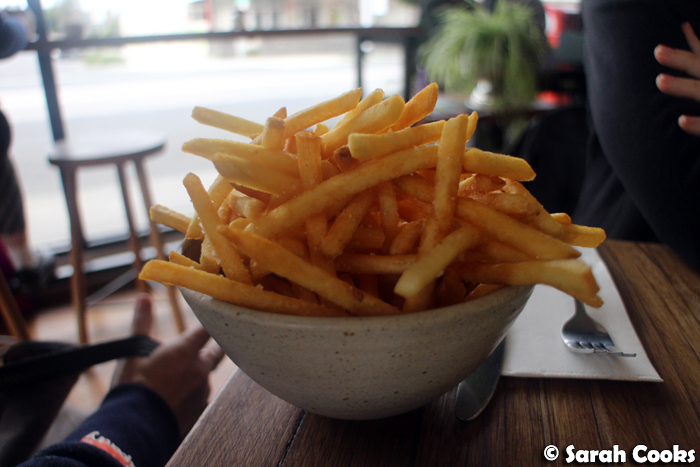 All of the fries! The gingerbread dessert was so good! It was pretty intense, so I think it might have been a bit much for just one person, but it was great for sharing. 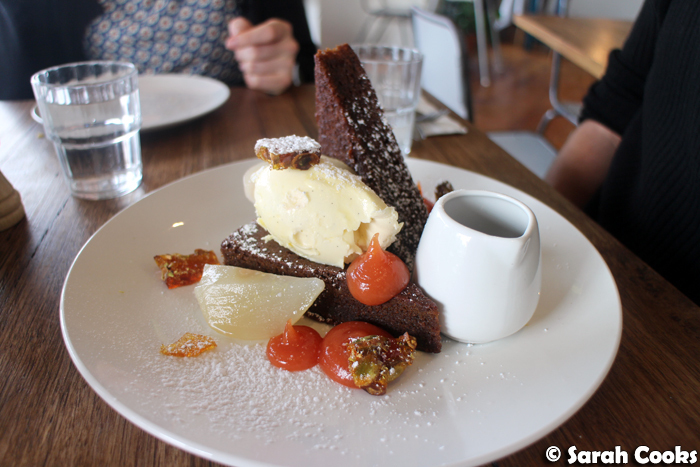 The gingerbread was incredibly moist (heh), with lots of rich spice to it. It was lightened up by the freshness of poached pear and quince (the menu said "paste", but I think it was poached), and the spices were balanced out by the rich and (relatively) bland vanilla mascarpone. There were chunks of pistachio brittle on the plate as well to add some texture contrast - these were perfectly crunchy, not too hard. And then there was the dark treacle toffee sauce. So rich, dark and sweet. Uggggh so good. So that was Short Round! 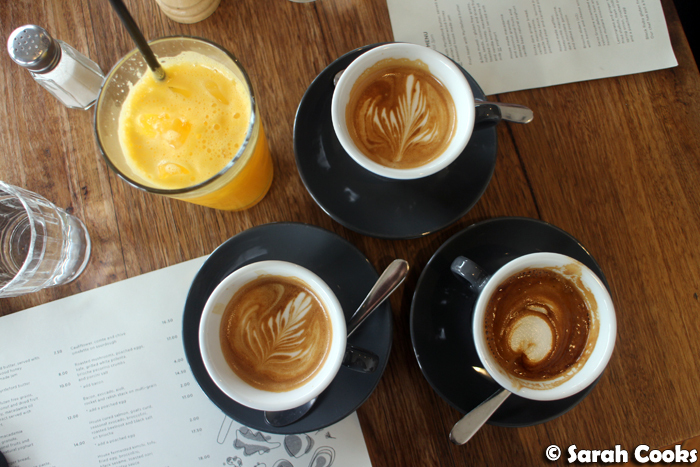 I'm glad it turned out to be a good choice - nice coffee, pleasant atmosphere, decent prices and delicious food. Hooray! Gingerbread is definitely my weakness but really I can't stop staring at all the fries in this post! Yum this looks delicious and as a northsider myself always looking for reccs in the area! 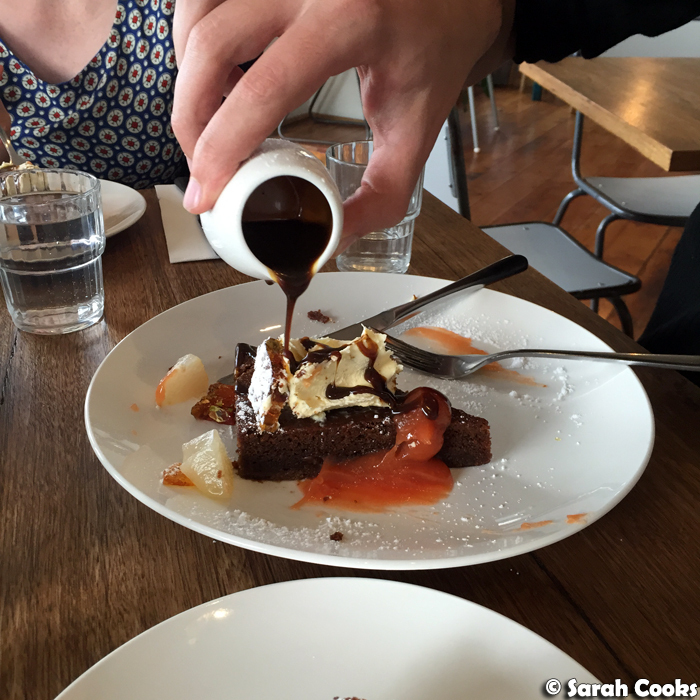 That gingerbread though *heart eyes* Love seeing a Northern café up on the blog, much closer to my hood! I have popped this on my 'to try' list, thanks Sarah!